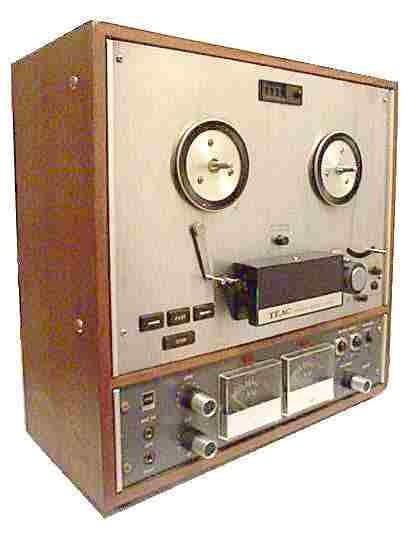 "Teac recorders are fantastic old beasts and are a breed that needs to be preserved." Here are some tips to keep your Teac going strong. Just remember your deck, even though large and heavy, is fragile. So go easy and take care as parts are scarce. Most repairs can be done by the owner as ordinary maintenance type repairs are all that is normally needed. Ok, You replaced the belt and it sounds as if the tape is running a little fast? Odds are the belt is on the 50 cycle "groove". Moving it down to the 60 cycle groove should cure the problem. The moral of this story is test play before reassembly. Are the reel holders falling off? are not pretty, but they work until a good pair of holders can be found. Is the original power cord damaged or lost? Purists may not agree, but possibly the best and safest solution is to hardwire a permanent cord. 1. Obtain a cord, heat shrink tubing, and a strain-relief from The Home Depot, Lowe's, or even Walmart. 2. Drill an appropriately sized hole along side the original connector. 3. Attach strain relief and install new cord/ strain relief into hole. 4. Unsolder the wires on the original connector. 5. Slide lengths of heat shrink tubing onto the original wires. 6. Solder in the new cord. Slide the shrink tubing over the joint and shrink the tubing. MOST IMPORTANT! Do not simply solder the new cord ends to the original connector as this creates a very dangerous uncovered shock hazard! Operate the deck in an upright position so heat can dissipate through the top grill. Horizontal operation can shorten deck life! Cleanliness of the deck, inside and out is essential. A clean tape path and clean heads are critical to best performance as is regular demagnetizing. Professionals clean the tape path and heads and demagnetize before every recording session. 1. The tape path, including heads, capstan shaft, pinch roller, and anything the tape touches along the path can be cleaned with isopropyl (rubbing) alcohol. 2. For parts (capstan shaft, pinch roller, unsealed motors) needing lubrication, a few drops of a fine machine oil (3 in 1 oil or sewing machine oil) will do the trick. An oiling syringe is very handy, almost a necessity, for oiling the motors with oiling tubes or ports. Remember, a little goes a long way. These are a few tips that apply to most Teac decks. If you have questions or have a new tip, feel free to contact us.